You can never have too many slow cooker recipes! So here’s some more great Low-Calorie Slow Cooker Recipes, all from the Eating Well website. Slim down with these satisfying slow-cooker recipes. If you’re trying to lose weight, consider your slow cooker your new best friend. Our low-calorie slow-cooker recipes and crock-pot recipes make it easy to cook healthy, affordable meals without having to spend hours in the kitchen. For 350 calories or less per serving, these low-calorie and diabetes-appropriate slow cooker recipes and crock-pot recipes for stew, chili, soup and more are delicious, filling dinners will help you stick to your diet and still eat delicious meals. Serve this zesty bean and barley soup garnished with chopped fresh cilantro and a squeeze of lime, if desired…..
Black beans, earthy mushrooms and tangy tomatillos combine with a variety of spices and smoky chipotles to create a fantastic full-flavored chili. It can simmer in the slow cooker all day, which makes it perfect for a healthy supper when the end of your day is rushed…. Here’s a dinnertime warmer with a hint of spring’s sweetness, designed for that day when you’d rather be outside raking the leaves from the garden, getting it ready for what’s ahead, than slaving over the stove….. I knew I would be busy most of the day so I wanted something that wouldn’t take that long to prepare. Nothing easier than a Crock Pot Meal so I decided to make some more of the 3 Bean Turkey Chili! I browned and seasoned the Ground Turkey the night before so in the morning all I had to do was open the Beans up, start the Crock Pot and add everything to the pot. I set it on low and I was done. By 5:00 the Chili was ready, you could tell by the aroma that had filled the kitchen. I topped with a handful of Shredded Gouda Cheese. On the side I had a few Oyster Crackers and a slice of Cornbread my Mom had fixed for their dinner yesterday. For a dessert/snack later a bag of Jolly Time 100 Calories Mini Bag of Pop Corn. Life is good! 5 Dashes of Frank’s Hot Sauce or to taste. *COOK turkey in large saucepan on medium-high heat 10 min. or until no longer pink, stirring occasionally. Add all remaining ingredients except 1 can of the tomato paste and the cheese and crackers. *ADD to slow cooker and add in the remaining 1 can of tomato paste. *COVER with lid. Cook on HIGH 3 to 4 hours (or on LOW 5 to 6 hours). *Serve in bowl or mug with cheese and the oyster crackers, A Tablespoon of fat free sour cream, or serve with some home made cornbread ears. 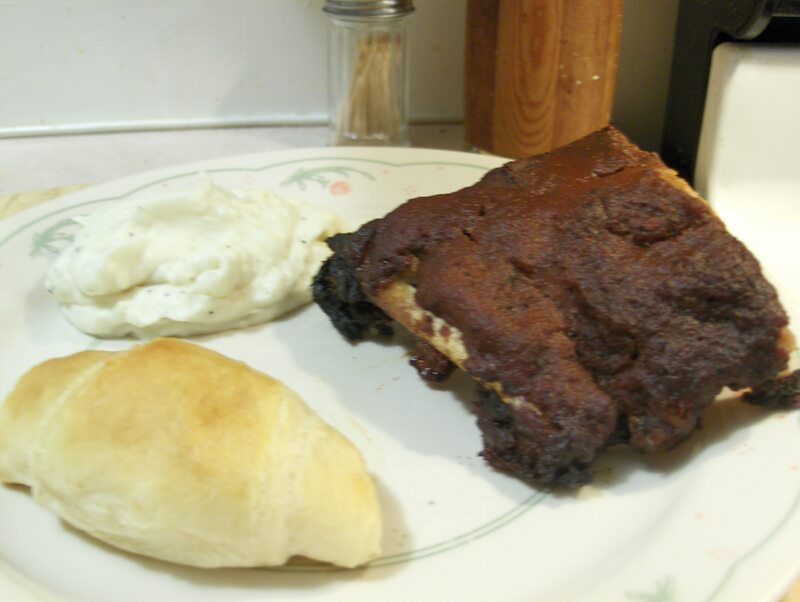 Back by popular demand, by my parents, for dinner the Crock Pot BBQ Baby Back Ribs! I used Kroger Pork Baby Back Ribs. While I had the crock pot warming up I cut the rack of Ribs in half, to fit in the crock pot, and seasoned the Ribs with JB’s Fat Boy Premium Rub and I then brushed on a half a bottle of JB’s Fat Boy Haugwaush Bar B Cue Sauce. I cooked the ribs for 8 hours on low in the crock pot. After 5 hours I applied the other half of Haugwaush to the Ribs. The ribs came out tender fall off the bone delicious. No knife needed as the bones could be removed by just pulling on them. 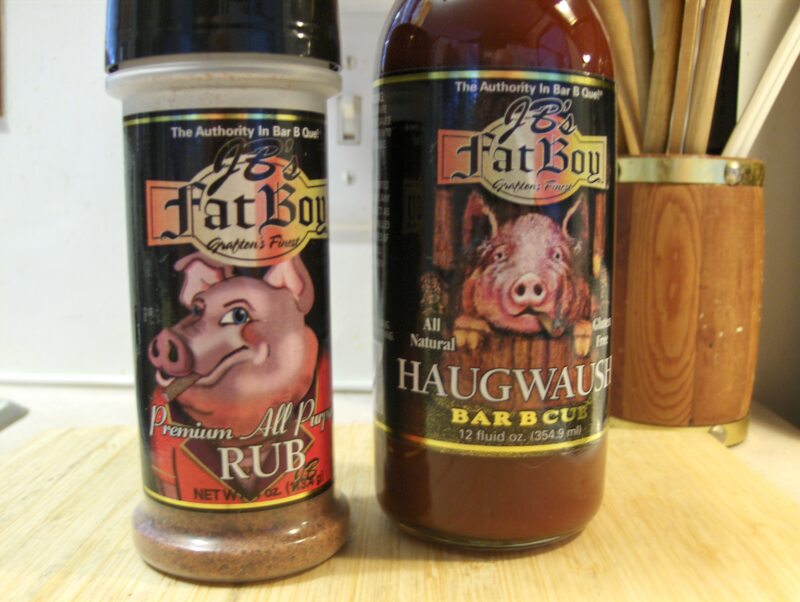 My rub and sauce are both J B’s Fat Boy products. So far Kroger and on-line are the only places I’ve seen that you can purchase J B’s products. For sides we had Bob Evan’s Mashed Potatoes and a loaf of Pillsbury Reduced Fat Crescent Rolls. For dessert later a Yoplait Delight 100 Calorie Chocolate Eclair Parfait. It’s a cold and rainy day outside today but it’s warm and hearty here on the inside. Nothing is any easier than to fix dinner by using the crock pot. 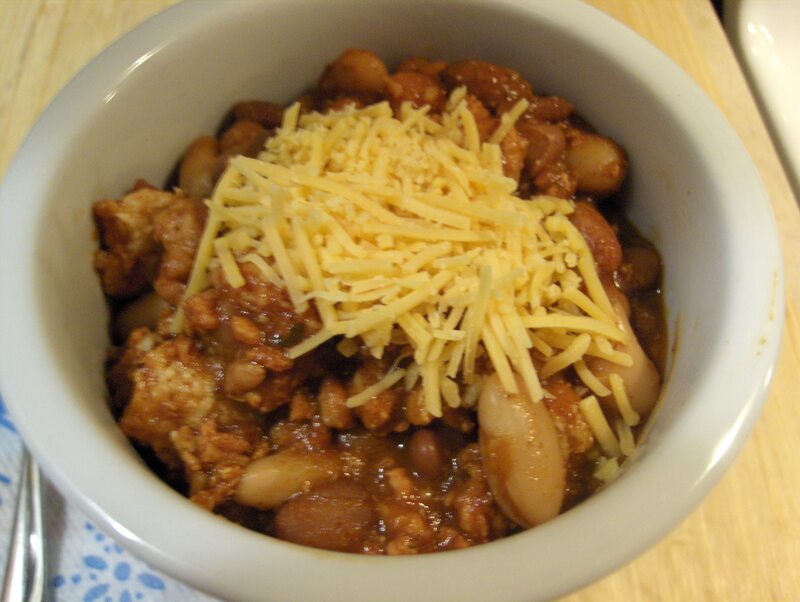 One my favorite crock pot recipes is Three Bean Turkey Chili! This is a fun recipe because you can make it as hot or as spicy as you want. Mine with all the ingredients comes out about medium hot. I could eat it a lot spicier but my parents are not fans of spicy or hot. 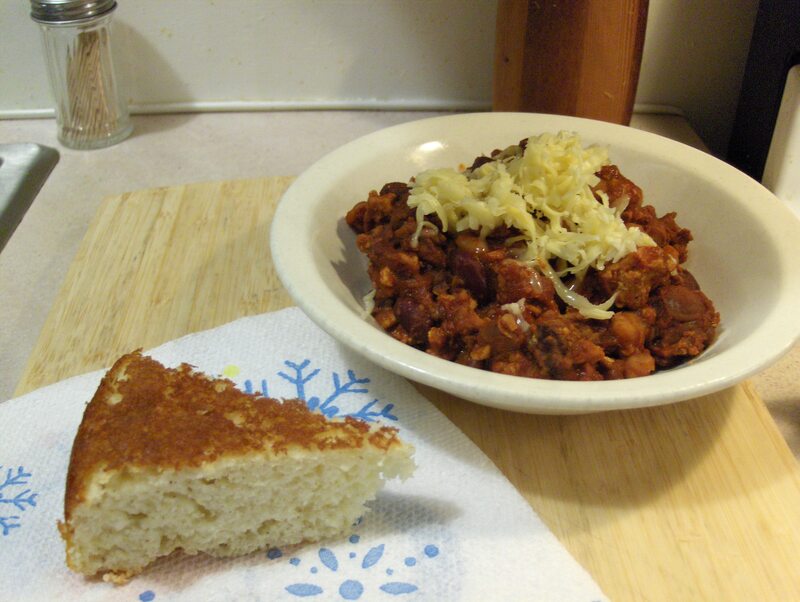 I like my Chili hearty and thick but if you like yours a bit more thinner or with a soup you can add more water to this recipe to thin it out. I had a side of Cornbread Ears that I had baked. Today’s Menu: Slow Cooker Chicken w/ Carrots and Harvest Grain Loaf Bread. I fixed the Slow Cooker Chicken I had posted earlier in the day! Nothing but good! For the recipe just checking on the posting earlier today. Along with Chicken I had sides of boiled Carrots and Kroger Bakery Harvest Grain Loaf Bread. 1. Combine soup, mushroom pieces, onion, chicken, and wine in slow cooker. 2. Cook on Low setting for 2 1/2 to 3 hours. Today’s Menu: Slow Cooked Caribbean Pot Roast. I posted this recipe earlier and I made it for tonight’s Dinner. A very tasty recipe! The roast and veggies turned out great! Good recipe to try if you haven’t yet. Another good one from Taste of Home! The recipe calls for 1 Tablespoon of White and Brown Sugar, you could use Splenda Brown Sugar instead. * skillet and heat through. Pour over beef. Nutrition Facts: 3 ounces cooked beef with 1/2 cup vegetable mixture equals 278 calories, 12 g fat (4 g saturated fat), 74 mg cholesterol, 453 mg sodium, 16 g carbohydrate, 3 g fiber, 25 g protein. Diabetic Exchanges: 3 lean meat, 1 starch, 1 vegetable, 1/2 fat. Today’s Menu: Dill Pot Roast on Whole Wheat Noodles w/ Mashed Potatoes, and Harvest Grain Loaf Bread. Used the leftover Dill Pot Roast and Mashed Potatoes from the night before. Cooked some Ronzoni Healthy Harvest Whole Grain Noodles in water and the Pot Roast broth. Served the Pot Roast over the noodles a side of Mashed Potatoes and the Harvest Grain Loaf Bread. Today’s Menu: Pot Roast Sandwich and Baked Potato. olive oil and seasoned with sea salt, pepper, and dill. Cooked on high for 6 hours. Used whole grain bun. Had to make another batch of this! Simple and easy.